I've never been a huge "resolutions" person. I also don't really subscribe to that "new year, new you" mantra. I'm still me. Who me is will shift over the years, hopefully, cause who wants to stay the same, but at my core, I'm still Sarah. The core values and beliefs aren't changing any time soon, especially not just because it's a new year. That being said, I do like to set goals. I don't always make them, but it's nice to have some to look forward to. Overall, I think I did pretty well with them. I have kept up my gym time, even while pregnant! That whole eating better thing went out the door with my energy, but I do try and eat some vegetables or fruits every day! We traveled to two new places this year - Tennessee and Cape Lookout! We did okay with saving, but also had some big expenses, so I'm giving myself that one. And up until the last month or two, I've done pretty well with this blog. That whole get more involved at church thing? Failure, big, fat failure. We should probably work on that. This year, 2018, is going to be a whole new world for us. It's exciting and terrifying. If you don't admit to both as a soon-to-be parent, I'm convinced you're lying to yourself. Learning how to keep another human alive while still keeping some semblance of yourself, your marriage, work and friendships is pretty daunting when you think about it. Which brings me to my word for this year. 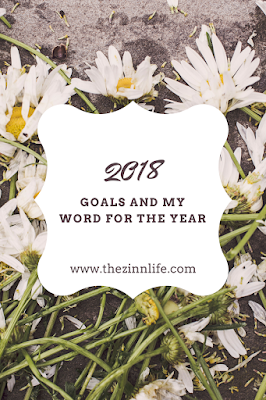 When I started writing this post, it was going to be about my goals for 2018. And I kept coming back to this one thing: grace. Grace for myself, for Aaron, heck, everyone. I want this to be the year of grace. Grace for me. In about two months, we're going to have a baby boy. Our world is about to implode. I'm aware of this. But I'm also a control freak, type A, perfectionist. You can say, "oh that will go out the door with the baby!" Obviously, you haven't met the other women in my family who are also the same way even after having babies. This means I'm harder on me than anyone else. I've had to learn to give myself grace in this pregnancy. Grace for not working out as hard, not eating as well, not blogging as much, etc. I can only imagine how much more grace I'm going to need when this kid is here. Grace for Aaron. I don't know who has a harder job in this - new moms or dads. There is so much that falls on women as the mother - carrying the child, birthing the child then all the feedings, etc. But if I think about it and think about the guys, the dads, it's got to be hard to not be able to do much. Or to feel like you're always doing the wrong thing. Like there isn't anything that you can do right, which I imagine is how we can make them feel thanks to the surge of hormones and sleep deprivation. Physcially, there is no comparison, but mentally and emotionally, I think it can be a toss up. I hope that this year I remember to give grace to Aaron. That he gives me grace. We're going to screw up, we're going to say the wrong things, but I hope that we always remember we're in this together. Grace for everyone else. If there was a ever a time that this world needs grace, it's now. There is so much division, so much hurt, I pray that we can all put aside the politics, the fear and give each other some grace. Because God gives it to us each and every day and we sure don't deserve it. 1. Survive. The closer I get to having this baby, the more anxious I get. Excited, yes, but also anxious. Anxious about finances, about going back to work, about what life will look like this time next year. It's going to be an adventure and I am excited for it, but I also know there are going to be some rough patches. It's life. I know that. Which takes me back to that word - grace. 2. Keep blogging. When I started this blog, I set a goal of 3 days a week. I mostly kept up with it, but the past few months, I've been consistently doing one post a week, sometimes two. And I'm okay with that. As long as I keep it up, I'll be pretty proud of myself. 3. Be healthy. I very specifically did not include weight in this goal, just healthy. I'm really proud of myself for keeping up with my workouts during pregnancy, even if my overall eating has gone to crap. I've told Aaron that I want to keep working out even after the baby is born and I'm going to make that a priority. And he's agreed to help me with that. It's such a big part of me now and I don't want to lose that. I also want to get back to eating healthier. I've been working on making freezer meals, so I'm hoping that will help. If things are already prepared and I don't have to do any work, I'm hoping that means I have a better shot at not eating like crap. Only three goals this year, but I think that's in line with giving myself some grace, some leeway in this new world. This sounds like a downer post, but honestly, I'm excited and we have a lot to look forward to! But I also feel that it's important to be real, to be honest with where I am and what I'm feeling. Otherwise, why would you want to read this blog?! What about you? What are you excited for in 2018? Do you set a word or goals for yourself each year? Happy New Year Liz! Thank you so much! Here's to trying not to lose my mind! Whew, I really haven't ever set goals or resolutions however this year I have - to be healthier & try not to worry about EVERYTHING. We'll see how that goes! You can do it! Baby steps! And congrats on your wedding! What a way to close a year and start a new one! You have such exciting changes coming soon! I love how your word choice isn't the idea of taking on something new, but rather of accepting what is already there. Do what works for you. Only you can know what the right schedule is for you. Can't wait for the new little one. Congrats on being so close to meeting your baby boy :) You have so many great goals.